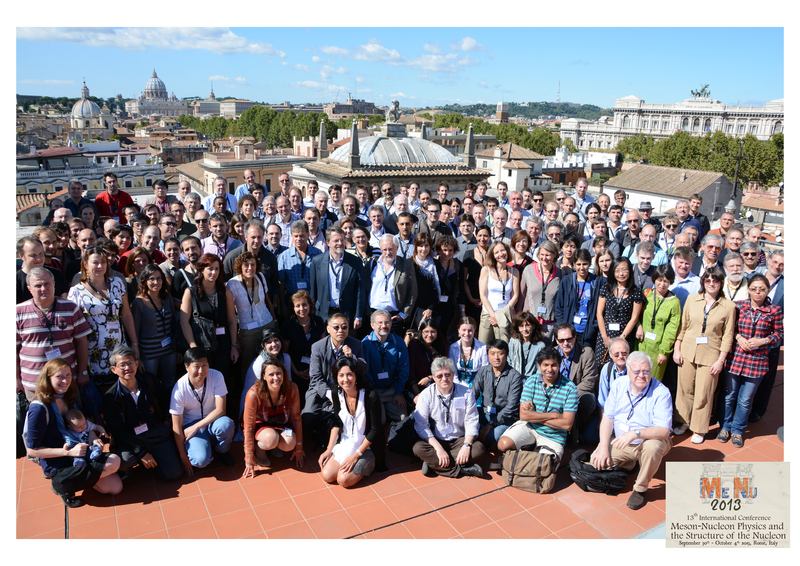 MeNu2013, the 13th International Conference on “Meson-Nucleon Physics and the Structure of the Nucleon” (http://menu2013.roma2.infn.it) was held in Rome (Italy) from September 30th to October 4th 2013. The Conference belongs to a series started in Karlsruhe, Germany (1983) and continued in Los Alamos, USA (1987), Gatchina/Leningrad, Russia (1989), Bad Honnef, Germany (1991), Boulder, USA (1993), Blaubeuren, Germany (1995), Vancouver, Canada (1997), Zuoz, Switzerland (1999), Washington DC, USA (2001), Beijing, China (2004), Juelich, Germany (2007), and Williamsburg, USA (2010). More than 200 physicists, both experimental and theoretical, convened from all over the world with the aim of exchanging expertise and confronting different approaches to the study of quark confinement and to the understanding of how hadrons are formed of quarks and gluons in a quantitative way. The experimental efforts carried on in many accelerator facilities through the world (JLab, MAMI, Bonn, GSI, CERN, J-PARC, BesIII, LNF) were presented, covering the search for exotic mesons and missing baryons, the spin and flavor contents of the proton, the investigation of the strange sector of the nuclides, the study of parity and time-reversal violating effects. Some of the latest phenomenological tools and theoretical models, which allow for a multidimensional picture of hadrons, have been reported and compared with data, aiming at achieving a deeper understanding of the non-perturbative regime of QCD. 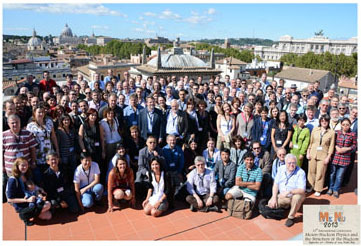 The International Advisory Committee was composed of distinguished and widely known physicists in the field (http://menu2013.roma2.infn.it/iac.php) and guaranteed high standards for the choice of topics and speakers. MeNu 2013 was preceded by the PWA7 satellite workshop (http://www.ge.infn.it/pwa7/), which took place at Camogli (Ge) on 23-27 September 2013 and addressed the problem of disentangling contributions from overlapping resonances through partial wave analysis. Hints of physics beyond the Standard Model where covered by the satellite meeting on “New generation of beam dump experiments to search for Dark Matter”, which followed MeNu 2013 in the same venue. MeNu2013 was organized with the support of the Istituto Nazionale di Fisica Nucleare (INFN), it was sponsored by the Thomas Jefferson National Accelerator Facility (JLab), the Jefferson Science Associates (JSA), the University of William and Mary, the University of Rome “Tor Vergata” and CAEN. It was also endorsed by the International Union of Pure and Applied Physics (IUPAP). The next edition of the MeNu Conferences has been agreed to take place in Japan in 2016.